← View 155: Tis the Season…Hockey Season! Earlier this year, Brenda Tharp wrote about Taking Risks as she took part in a creative assignment where you purposely took a photo out of focus. I even commented on how tough I thought getting a good one would be. Brenda’s out of focus photo was excellent. 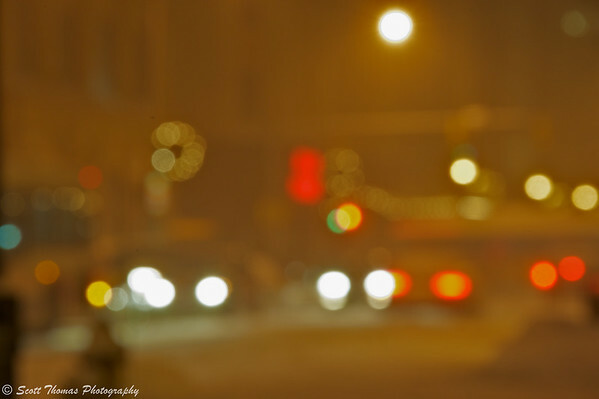 As I looked through my viewfinder down Salina Street in Syracuse, New York on a cold and wintery evening. I saw an unfocused scene and I remembered Brenda’s post. I loosened the ball head on my tripod and re-composed and put my lens in manual focus. This is the result. Winter weather on Salina Street in Syracuse, New York. Nikon D700/28-300VR, 1/2s, f/16, ISO 800, EV +1.0, 300mm focal length. I still need to keep practicing and I need to do that panning photo I mentioned in the comment. It’s a start! This entry was posted in Photography and tagged 28-300mm, abstract, brenda tharp, focus, manual, new york, nikon D700, syracuse, tripod, unfocused, vr. Bookmark the permalink. Scott, there’s just something about unfocused lights that captures the magic of the Christmas season. I agree and there’s lots around the blogs these days. Enjoy! I have many such shots like this. Wether on purpose or by accident! The question lies in does it make it a good photograph because you intended to create a blurred shot, or is it the purpose and title that you give a bad shot an opportunity to be something other than what it is? “A mistake” ! In this case, it was on purpose though I have found happy “accidents” which worked. I do feel the composition is not as good as it could have been. Something to improve upon in the future. Interesting idea that would seem to work well with holiday lights. Could refill the photography passion bucket on short winter days when many of us have limited opportunities to shoot. Aye, during winter storms and long nights, a string of Christmas lights have endless possibilities. Oh! Pretty! I spend a lot of the winter looking at the world through snowy glasses, so this is a familiar, um, sight. My glasses were like yours today, Gerry. Lots of bokeh induced fogged over glasses. This is interesting and very pretty! Like Gerry, I am reminded of how winter looks through my steamed up, snowy glasses. I like the out of focus Christmas lights shot, I discovered that while making video clips and it has a cool effect but trying to capture that same image is not as easy as the video. Time to play 😉 I love that – and all the fun of doing something new or ” wrong “- and being surprised! Photography is supposed to be fun, right? I’ve done blurred shot panning but not on purpose out of focus. I like your photo and I may dare try this! My feelings are that you’ve given the effect of taking the shot in the middle of snowstorm without actually having to be out in the middle of a snowstorm! I imagine you’ve had about enough of that for a while at least! I am always happily surprised when I get a picture like this… even if it is a mistake. The mysteries of photography. I like those unusual shades in your picture.